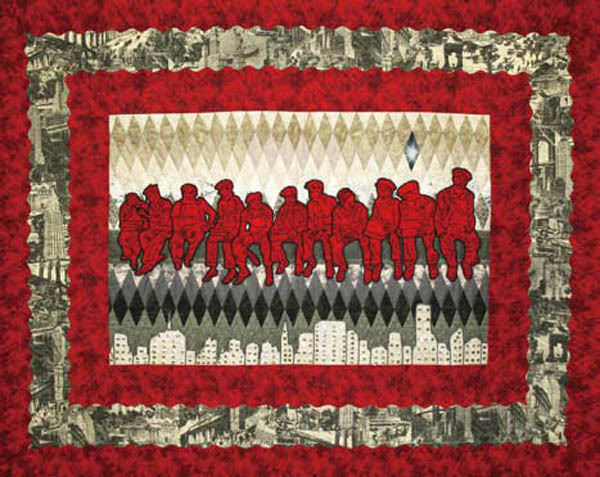 “Tribute to the Mohawk Ironworkers”, 2008, by Carla Hemlock, pays homage to the Mohawk skyscraper builders from KAHNAWAKE reservation near MONTREAL. For over a century, these fearless men have tread narrow steel beams high above MANHATTAN, working on iconic structures like the Empire State Building and the World Trade Centre. Ms. Hemlock’s wall tapestry, in quilted cotton and beads, is part of the Smithsonian Institution collection in WASHINGTON, DC. It’s currently in the exhibition “Changing Hands: Art Without Reservations, Contemporary North American Art for the Northwest and Southeast”, at the McMICHAEL CANADIAN ART COLLECTION, Kleinberg, Ontario, until June 2/2013. This entry was posted in Art & Design and tagged Canada, Kleinberg, McMichael Canadian Art Collection, Ontario, Toronto, Tribute to the Mohawk Ironworkers. Bookmark the permalink.